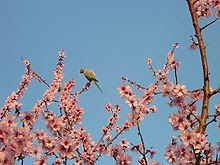 I always feel spring has come to Provence first with the cheerful yellow flowering Mimosa quickly followed by the delicate light pink blossom of the almond tree. All around us we see the flowering almond trees, not just in the gardens but growing wild on the hillsides and we feel it is part of the flora of the region. The history of the almond tree is quite interesting. It is native to the Mediterranean region of the Middle East, spreading eastwards up to Pakistan. The Phoenicians, Greek and Romans who all introduced the almond tree to the rest of the countries around the Med, as far as Spain and northern Africa. The almond tree was first introduced to France in the 8th century and to north-western Europe at the end of the Middle Ages. The first almond tree was planted in England in the 16th century. In Elizabethan cooking large quantities of the nut were used and almond water was used as a substitute for milk in recipes. Nowadays the major producer of almonds is the USA with 41% of the world production, followed by Spain with 13% and various other countries making up the rest. There are two types of almonds, Prunus dulcis var. dulcis (sweet almond) and the Prunus dulcis var. amara (bitter almond). Quite difficult on sight to differentiate between the two, but in general the bitter almond flowers are a deeper pink and the nuts are broader and shorter than those of the sweet almond. Both the sweet and the bitt er almonds contain al mond oil (50% of the nut) which is procured by pressing the almond. The bitter almond is used to boost the flavour of products made with sweet almonds like for instance the liqueur Amaretto. The bitter almond contains prussic acid, which occurs in many of the leaves and seeds from our most common fruits like apple pips. Prussic acid is poisonous and the bitter almonds have to be heat treated before they can be used. Sweet almonds are used for culinary purposes and almond oil is a widely used oil in cosmetics, in massage and as a the most common carrier oil for aromatherapy. Ah, everyone wishing Spring was sprung and yet so cold today – maximum promised for tomorrow is +1°C ! The wild almond blossom everywhere looks so pretty and delicate. Votre jardin doît être très protégé – il est encore assez tôt pour les abricotiers ?! Le verger est bien exposé par contre le mimosa qui est plus bas sur le terrain a eu froid, j'espère pouvoir le sauver. L'abricotier appartient à la variété Polonais, c'est peut-être une variété précoce car j'ai parlé avec quelqu'un qui a également un abricotier Polonais en fleurs. L'amandier qui est de la variété Ferragnes n'est pas encore en fleurs.